The newly remodeled “Patio at Alley 21” is bright, spacious and family-friendly, according to the owners. 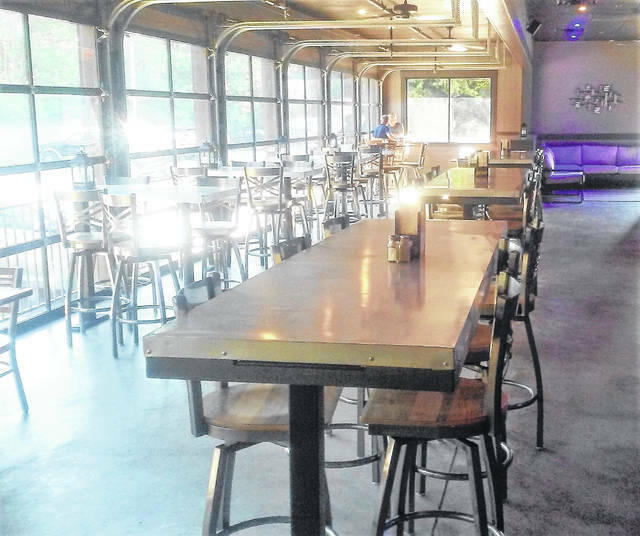 What had originally been intended for parties, family reunions and corporate functions has been transformed into an open-air patio with eight glass garage-type doors at Alley 21 Neighborhood Gar and Grille in Hillsboro. The result is a concept fresh from the streets of Manhattan that has a unique small-town feel. “I felt because we had been as successful as have been that we wanted to give something back to the community so that people could have the feeling of sitting outside, and just relax and have a good time,” Bailey said. Faye Gann, another of the restaurant’s six owners, said she wanted an atmosphere like someone would find at a family reunion, where a family doesn’t have to worry about what to wear and can bring the kids along as well. She was quick to point out that Alley 21 is a full service bar and grille, so whatever is ordered inside can just as easily be enjoyed in the new patio surroundings. Dina Gruber is Alley 21’s “mixologist,” tends bar in the new patio addition, and had high praise for the remodeling. With the Cincinnati Bengals kicking off their NFL season Sunday, Gruber said the drink of choice among football fans seems to be Bud Light. For the Bengals games, Gann said Alley 21 will have a special for Cincinnati football fans. An unofficial contest of sorts is underway to give the new facility a name. “We’ve had a lot of entries and suggestions, and we’ve narrowed it down to around eight names,” Gann said. For Bailey, though, one suggestion seems to stand out from the others.